Leadership is one asset that doesn’t show up on the stat sheet, and safeties often fill that void within a defense. They can see the whole field and are therefore expected to assume a more advanced role. And with the influx of impressive all-around safeties coming out of the drafts in recent years, the safety position has become even more dynamic. Here are PFF’s top-10 free agent safeties. 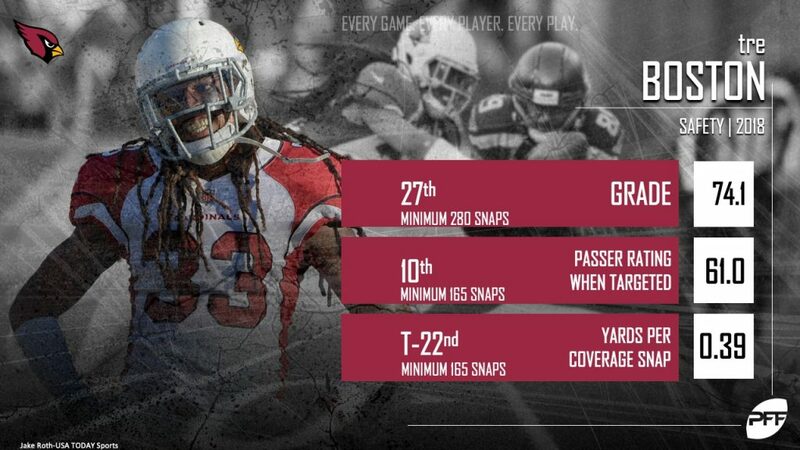 Thomas isn’t only a top free-agent target — he’s one of the best defensive players in the NFL. With a 91.3 overall grade in 2018, he ranked second among all safeties (and was one of only two to crack a 90-plus mark). Unfortunately, that grade was reflective of only the first four games of the season, but after posting a 90-plus grade in two of the three previous seasons, he’s clearly made his mark as an elite safety with little to prove. It was certainly a down year for Collins, especially after his breakout 2016 campaign. After earning an 80-plus grade in each of the past two seasons, he regressed to a 70.4 in 2018. Even so, he still finished with 34 stops, fourth among safeties. While 2018 wasn’t all he had hoped for, Collins sheer skillset and production from the past two seasons is enough to pit him among the league’s best. On an unquestionably elite Chicago Bears defense, Amos Jr. has been a stalwart. After allowing passer ratings when targeted of 115 or higher in his first two years, Amos Jr. has brought that mark down around 80 for the past two seasons and has subsequently become a top cover safety. And with Amos being just 25 years old coming off his rookie contract, suitors will be lined up for a chance to add him. Joyner is another safety who has made his mark over the past two seasons. After posting a 90.3 overall grade in 2017, he admittedly fell off a bit in 2018 with a 73.1 mark. That was due in part to a less active season in coverage, where he didn’t notch five pass breakups for the first time in three years and allowed a passer rating in coverage above 100.0. However, he didn’t allow a completion of more than 19 yards on the season and missed just five tackles on 1,100 snaps. 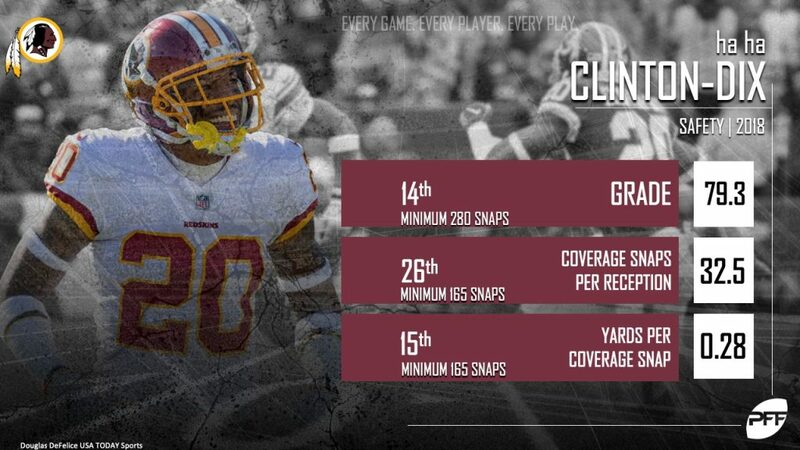 Clinton-Dix got a fresh start in the middle of 2018 after being traded to the Washington Redskins, and the former Alabama star had his best year yet with a 79.3 overall grade. He continued on his impressive trajectory in coverage, where he now has 17 interceptions, 17 pass breakups and just five touchdowns allowed. Not to mention, he’s also played 1000-plus snaps in all five of his seasons, making him a sturdy and reliable option for a team looking to upgrade. The Honeybadger became a staple in the Arizona Cardinals secondary for five years before joining the Houston Texans for the 2018 campaign. And while he did struggle a bit in coverage, allowing six touchdowns and a career-worst 594 yards, Mathieu is coming off his highest-graded season since 2015. That’s due in large part to his run defense, where he racked up 12 run stops (T-23rd) and subsequently earned an 83.9 grade in the category. Boston is likely the most underrated safety on this list. He’s yet to earn a grade below 70.0 in his five seasons with three teams. And the longest pass he gave up all year was 22 yards — which is quite impressive given how often safeties are burned deep. 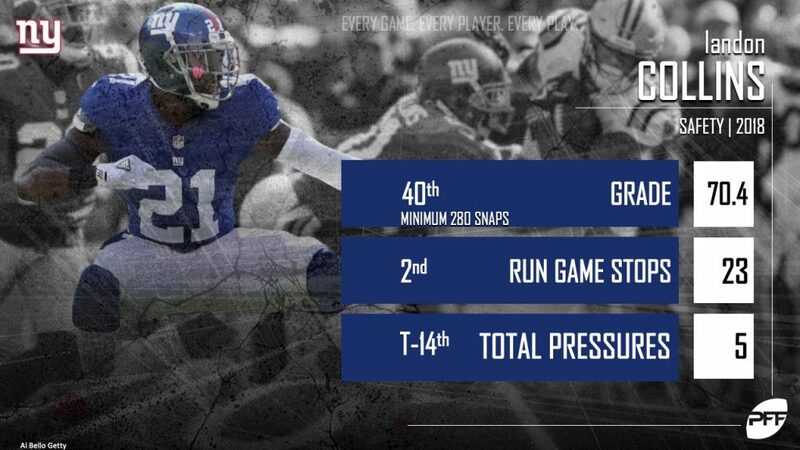 Despite a shortened season in which he played just 237 snaps, Mitchell was impressive. He recorded 12 stops (constituting a win for the defense), which was more than he had in a season with the Pittsburgh Steelers from 2014-2016. And he played 1000-plus snaps in those seasons. Even at age 31, Mitchell can still patrol the back end at an elite level. The former first-round pick didn’t have an exceptional year, allowing a career-high 14.6 yards per completion, but it was one that fit the mold of his solid career. Reid has been a consistent force in his six seasons, allowing passer ratings when targeted less than 100.0 in four of them and reception rates below 70 percent in six of them. Iloka was used sparingly in his first season with the Minnesota Vikings after being a staple in the Cincinnati Bengals’ secondary for years. So while he played just 118 snaps in 2018, potential landing spots will certainly look to tap into the production he had with the Bengals, where he consistently excelled in coverage.